Highly decorative first editon map of London with vingette advtising 'Wyld's Great Globe' in Leicester Square. 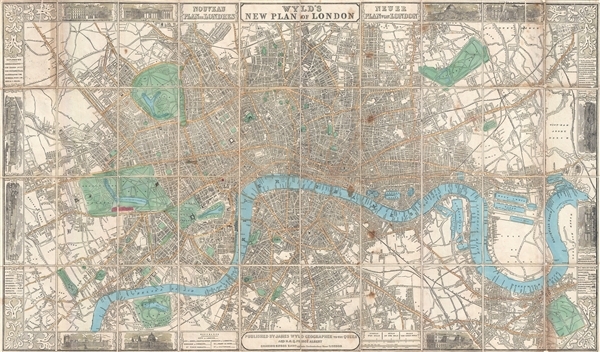 A thoroughly decorate 1851 first edition plan or map of London, England by James Wyld. Centered on Blackfriars Bridge, the map coves central London from Islington to North Brixton and from the East India Docks to Holland Park. Roads, parks, rail lines, important buildings, and neighborhoods are noted. To the left and right of center, the English language title is repeated in French and German, respectively. This map is notable for its remarkable border, with floral corner flourishes and vignette illustrations of London landmarks, including, among others, Buckingham Palace, the British Museum, the Bank of England, London Bridge, and the Houses of Parliament. Among the border vignettes, in a place of prominence just to the right of the title, can be found a self-promotional view entitled, 'Mr. Wyld's Model of the Earth in Leicester Square.' This is Wyld's Great Globe, an attraction built in 1851, the year this map was issued, in Leicester Square, which was then a private pleasure garden. It consisted of specially construction dome containing great sphere approximately 19 meters in diameter. On the interior walls of the sphere was a plaster of Paris scale model of the Earth. Scaffolding was erected at multiple levels so viewers could examine various locations in greater detail. The globe was a great success throughout its first year, but in subsequent years interest declined. The globe was deconstructed and sold for scrap in 1862. It was not until the 1935 construction of the Mapparium at the Mary Baker Eddy Library in Boson that a larger globe was constructed. The map was printed in 40 sections that were clearly designed to be dissected and mounted on linen, an event where here, apparently never occurred. This map was issued in 1851. The present example is the first edition, first state. There were a subsequent 15 additional editions with numerous updates and revisions to about 1877. Good condition. Minor wear on original fold lines, especially at fold intersections. Map has been professionally flattened and backed on archival tissue. Minor glue stain in the upper left quadrant. A couple of minor spots on the map itself, see image. Detached from but accompanied by original blind-stamped brown cloth covers with titles and publisher's advertisements to the pastedown. OCLC 83110220. Hyde, Ralph, Printed Maps of Victorian London, 1851 - 1900, #25.